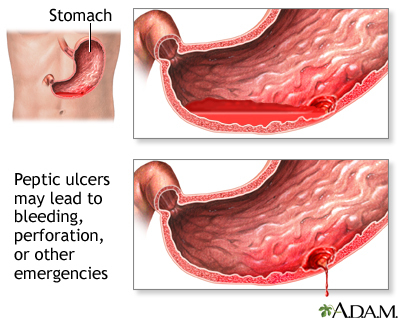 Peptic ulcers may lead to emergency situations. Severe abdominal pain with or without evidence of bleeding may indicate a perforation of the ulcer through the stomach or duodenum. Vomiting of a substance that resembles coffee grounds, or the presence of black tarry stools, may indicate serious bleeding.